Listen to me introduce some of the key themes. There’s never been a better time to be a woman. Thanks to those feminists who fought for liberation, young women today have freedom and opportunities their grandmothers could barely have imagined. Girls do better at school than boys and are more likely to go to university. As a result, women are taking more of the top jobs and the gender pay gap has all but disappeared. Yet rather than encouraging women to seize the new possibilities open to them, contemporary feminism tells them they are still oppressed. Women vs Feminism: Why We All Need Liberating from the Gender Wars challenges this stance, unpicking the statistics from the horror stories to explore the reality of women’s lives. 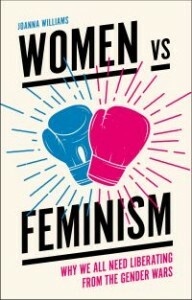 It argues that today’s feminism is obsessed with trivial issues – skinny models, badly phrased jokes and misplaced compliments – and focuses on the regulation of male behaviour, rather than female empowerment, pitching men and women against each other in a never-ending gender war that benefits no-one. Feminism today does women no favours and it’s time we were all liberated from the gender wars.